Moscow's hospitality sector has a reputation for high prices, and no wonder. The city has an abundance of glitzy 5-star luxury hotels, while at the other end of the spectrum, affordable 2- and 3-star lodgings are somewhat scarce. But good value can be found if you know where to look for it - and it doesn't have to be bunks in a hostel or even a capsule hotel; it can even be a proper hotel, sometimes in quite a choice location. 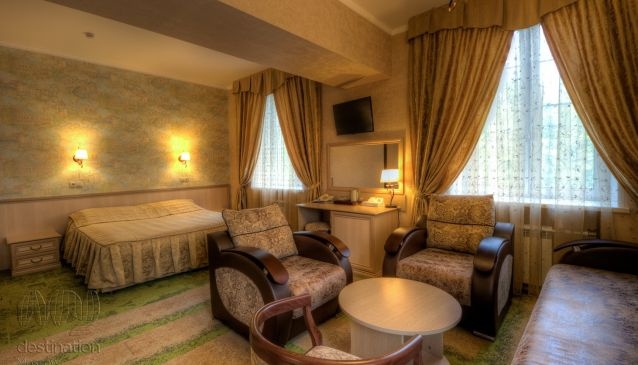 One example is the 3-star Zolotoi Kolos hotel in the city's north, where clean and neat hotel rooms are available at prices so low they're practically unheard-of in Moscow. Besides being a short walk from the VDNKh metro station, providing fast connections to the city centre, it's also right near some major attractions: VDNKh itself, one of the city's most interesting architectural and park ensembles offering some fascinating exhibitions, dining and other entertainment; the Cosmonautics Museum topped by a silver rocket statue; the soaring Ostankino Tower; the beautiful Botanical Gardens and the elegant, historical Ostankino Palace estate. The monorail is also nearby, providing a fun ride as well as convenient transportation to some of these sights. Zolotoi Kolos (or 'Golden Ear of Grain') opened in 1954. It offers 331 rooms of different price and comfort levels, from budget (dormitory) to comfort suites and luxe-studios, in six adjacent buildings on a pleasant street. All rooms have free Wi-Fi. The higher-comfort rooms come with individual safes, flatscreen TVs, hairdryers, dressing gowns and facilities for making coffee or tea. On-site services include a beauty salon, sauna, ironing room, tourist agency, gym and shop. There's also a conference centre and three cafes, where guests may enjoy buffet breakfasts included in the price of their accommodation. All in all, it's everything a budget-conscious traveller could possibly need.